There is a book out there called Re-Entry: Making the Transition from Missions to Life at Home. I honestly used to think it was silliness and one could never loose a sense of being so profoundly. But Thomas Wolfe had it right. I know that the sense of "home" varies. Coming "home" to this house took years. I always felt like I was coming home to someone else's house. Then I went away for a week long vacation a few years ago and entered the door feeling welcomed and at ease. Then now, once I start to feel that I have a place, it all shatters. I go to Mozambique for 3 little weeks and I feel "home". I feel a sense of peace and belonging and contentment. Even in the luxury of Cape Town, I wondered about Moz. Then I had days in Johannesburg where I literally sat for long hours and made lists in my head of good things I was coming home to, to motivate me. It went like this. End of list. And maybe Target. I will always miss Target. In line at the airport in Johannesburg an elderly couple asked me where I had been. I told them. They asked if I was in the north or south, and I answered them. They seemed to know the country well. They spoke fondly of its beauty and kind people. They asked if I would go back again and I told them that I was moving there in September. They looked at each other a little startled. The man said instantly, "Oh, then it must be for a man". His wife agreed and said, "No one would ever go live in northern Mozambique if it weren't for a man". I laughed. I said, "No. Not really a man. More like a boy. A bunch of them". I don't know if they got what I said. They seemed to just show pity on me and I just blushed a little embarrassed that I had no lover in the picture. All this is just to say, I am back. I am back in my country of origin. I am a days journey from people who share my DNA. I just blow-dried my hair. I made a whole pot of strong French Roast. But for some reason I feel very far from home. My last day in Cape Town was perfect. I got to have a warm breakfast of strong coffee, spinach and feta croissant, side of eggs soft scrambled with my new friend, Caroline at The Olympia Cafe and Deli in Kalk Bay. The bay, the ships, the shore, the conversation, the coffee,.all so perfect. I even got to go back to Groot Constantia and taste the wine Napoleon drank. I didn't even ask. They lady just gave it to me. She reminded me of Aunt Pittypat. She said I was not supposed to have it and it was not on the tasting list, but I think she liked me and she pulled it from the shelf. Or maybe she just wanted a taste herself, either way, I loved it. She says that they still find bottles from time to time along shores in various places. The bottles are marked with a seal within the glass reading Groot Constantia. She said they have found them as far away as Maryland and shipwrecks have revealed whole bottles, empty. Maybe she had been hitting the sauce all morning or maybe it is true, either way, the entire experience was incredible fun. I am now at the end of my journey and unwinding in Johannesburg. I have another day here before attempting to board as a standby passenger Delta's direct flight home. I got to go around site seeing some yesterday! 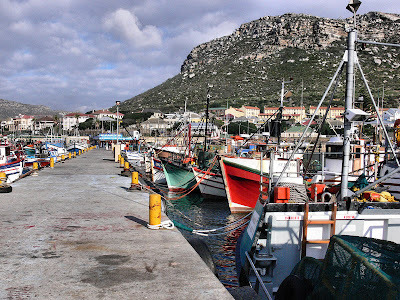 We saw Penguins at Boulder Beach, drove through Chapman's Peak, went to Hout Bay, through Simon's Town and to Groot Constantia for lunch. The drive was breathtaking and just incredibly stunning. I think Groot Constantia was my favorite. We had lunch there and I had Vegetable Curry in traditional Malay style. 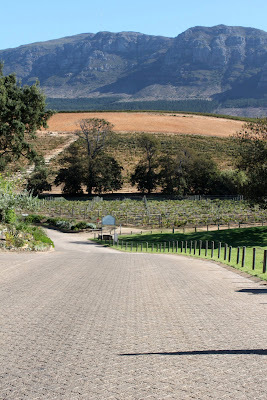 Groot Constantia is the oldest wine estate in South Africa. I read somewhere that they supplied wine to Napoleon. Their wine is out of this world. Lovely views, Georgian and Cape Dutch architecture. The day so different from the day before. Lush vineyards, rich Europeans and South Africans. Such a contrast from my day of fried bread sandwiches in a hot little shack in the township. I highly recommend them both. so just so you ladies know, it is 11:15pm. i am dog tired. in hartwell talk, that means exhausted, worn slap out. not sure why slap makes it more worn out than just worn out, but i am worn slap out. i have not stopped since i left atlanta. i have not really sat down, literally. they don't have sofas in pemba, days are full of walking and activity and hustle and jobs to be done. 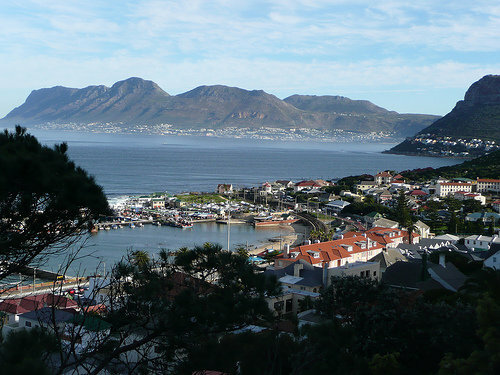 and now i am here in cape town and so anxious to see it all that i don't want to sit still. the time in mozambique flew by so fast and now i find myself here in cape town, a place i never believed i would get to see. it is lovely here. i think my biggest takeaway today is just how small the kingdom of God is and how precious (and i choose that word carefully) it is to be in it and to know Him. through Iris connections and through friends, i have been welcomed into this Christian community and am staying with a vicar of an Anglican church here in Cape Town. there is something profound and comforting to worship with others half way across the world and just talk about Jesus and His goodness with people of different nationalities. it expands my faith. it makes the world seem quite tiny. this town is very diverse, so many nationalities gather and worship yet it feels like family. so i HAVE to go to bed and crawl under covers and sleep deep. i am meeting a fellow mission school alum tomorrow for breakfast. i do not know her at all but she did the same mission school as i did and therefore we all become family in one way or another and she is entertaining me and showing me cape town tomorrow. i will post more photos and share much more soon. yesterday i went to Sweet Home Farm. quite nothing like what it sounds. it's name makes it sound like an organic bakery or a new plot at Serenbe. but it is an incredibly poor settlement where The Warehouse has become involved. they helped a woman named Christina open a restaurant. simple, basic, tiny little place, with the best fried bread sandwiches i have ever eaten. they are called amagwinyas. actually i think they are the only fried bread sandwiches i have ever eaten. either way, i want another one. they use the tiny space for meetings and Bible studies and prayer groups when needed. she will even cook for you if you come here. you have to call 24 hours in advance to let her know you are coming, but i hear her mealie pap is out of this world. she works alongside a Warehouse worker and former restaurant owner in establishing her small business. i seriously recommend this place if you are coming to Cape Town. i love total dives and this is the epitome, a real gem, a blessed treat. the Warehouse also offers HIV/AIDS support groups within the settlement and i am going to that today. 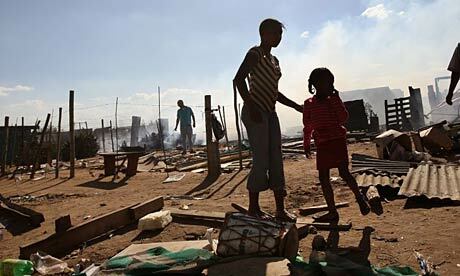 Sweet Home Farm is an informal settlement that was originally a rubble dump in the Philippi farm area and is now home to approximately 12 000 people, with around ten people per home. In 1995 it was a small group of 15 shacks, but has grown each year as people have settled there for lack of better options. It is still largely undeveloped in terms of access to water and electricity. "One of the problems is that half of the land is council land and the other half is privately owned, so the council cannot put in amenities like electricity and water," explains Goodman James, who works with Joy in the community, employed by The Warehouse, as well as a resident of Sweet Home Farm. Half of the community have no proper toilets and the other half share six families per toilet unit. Community leaders estimate that the unemployment rate is a shocking 70% and malnutrition and other social ills that go with poverty, pervade. "One of the most worrying things is the lack of access to education in the community," says Ntlalo Mgadela, a member of the community and youth worker, "And the children have to walk or go by buses to schools in other areas." He goes on to explain how the lack of ability to provide for one's family has resulted in many fathers losing hope completely as they watch their children struggle and not get the opportunity for a better life. "This leads to breakdown of the family unit," he said, "And it's soul destroying for the men in the community." The HIV/Aids rate is very high and the only clinic in the area services children and TB patients, but nobody else. Sweet Home Farm is a community facing many social evils and although only a few kilometres from the wealth of the suburbs and city centre, is excluded from the benefits. Most of the people who live there will never see the 'other side' of Cape Town. It is more susceptible to disasters such as flooding and fires, due to the lay of the land and the closeness of the homes, largely made up of wood and tin. i get to go to Sweet Home Farm today! really excited about seeing this. i arrived late last night and have been graciously accepted by The Warehouse and am being served Rooibos tea even now. even after three short weeks in Pemba, i instantly settled in to the life of children, noise, Portuguese, Makua, heat. i miss it already. overwhelmed by the hospitality here, of complete strangers taking me in, feeding me, giving me a warm place to sleep. i have a feeling i will deeply miss this place too when i leave. i am looking forward to hot water, fast internet and a diverse menu.